What is power? Where does it come from? Where does it go? Who has it? Who doesn’t have it? Who should have it? Who shouldn’t have it? And why? – or why not, for that matter – to any of those questions…? Perennial questions indeed, in just about any social context. But let’s try applying some of our RBPEA tactics to those questions, and see what comes up – perhaps particularly in terms of power and gender, given the linking-theme for this series of posts. As a ‘pro-feminist’ man in that period, I spent a lot of painful effort putting myself down, blaming myself for all women’s ills, as feminist theory of the time commanded me to do. The catch was that it just didn’t work: I felt a lot worse, of course, but the women around me didn’t feel any better – in fact they often got even angrier and more demanding because it didn’t work. Everyone lost out: and it just kept on getting worse and worse. In this model, we still don’t know what power is, but we do at least know where it is, where it comes from, and, from that, also have some idea of how to create it. That’s a huge improvement over the ‘pie-slice’ power-model. In systems-thinking terms, what we have here is a Reframe that combines Reciprocation with Resonance, providing a positive-feedback loop through which more and more power can be created, seemingly from nowhere, but ultimately from within each individual. Finally, she identifies cooperation exclusively with power-with, and competition exclusively as power-over – which probably makes sense enough at first glance, as long as we don’t look too closely at that somewhat-arbitrary conflation. Given the near-ubiquity in feminist literature of the time of slogans such as “men are the problem, women are the solution”, it’s easy to see how that part of the model arose: but it doesn’t take much of an assessment to show that, bluntly, that one error reduces this otherwise very useful model to little more than a self-serving, self-congratulatory, blame-raddled mess. Which is unfortunate – to say the least. Before we tackle that, let’s look again at those conflations around cooperation and competition, supportive versus destructive, and ‘masculine’ versus ‘feminine’. The gendering of cooperation and competition is the easiest to resolve: we don’t need systems-thinking tools for that, all we need do is look around. Everywhere we see both men and women cooperating with each other, and competing with each other, in many different ways. 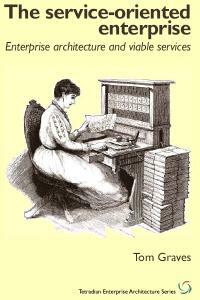 Although, yes, there are some apparent gendered-overtones, the assertion that gender can be assigned in an absolute sense either to cooperation or to competition – as Starhawk does in her model – is simply not supported by the real-world evidence. Let’s just drop it. Next, that conflation of cooperation with supportive, and competition with destructive. Again, look at the real-world. 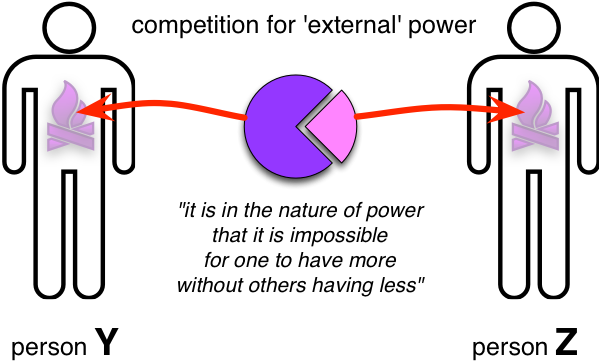 Competition can be destructive, yes – power-over, indeed, exactly as in the ‘pie-slice’ model. But it can also be constructive, such as when a team of sprinter-pacemakers push a longer-distance runner to performance she could not have achieved on her own. We’d also frequently compete with ourselves to push us to develop our own skills: that’s the basis of gamification in single-user apps, for example. And likewise, whilst cooperation might usually be supportive, it can also be destructive – such as when people group together (cooperation) to tear someone else down (dysfunctional-competition). So again, the conflation in Starhawk’s model is not supported by the real-world-evidence, and it’s best to just drop it. 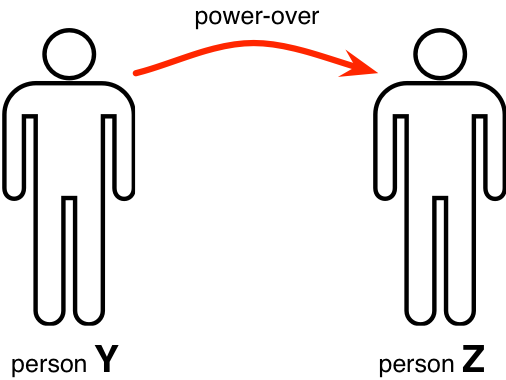 Instead, in practice, the crucial issue with both cooperation and competition is not those social modes themselves, but the overall aim of the interaction – whether it is ‘with’ the Other, in one of many different senses, as a form of power-with; or ‘against’ the Other, likewise in one of many different senses, as a form of power-against. However, we still haven’t fully resolved the gendered assertions around power itself – the assertion that constructive power-with is exclusively-feminine, and destructive power-over exclusively-masculine. And we also still have no actual definition of what power is – which is probably a point that we need to deal with first. 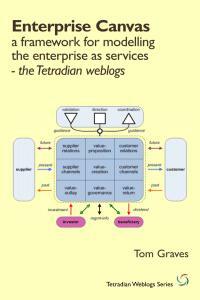 To resolve that, call on systems-thinking again, and pull in an example from another domain. And in physics, the term ‘power’ in effect represents ‘the ability to do work’ – with work formally defined as ‘the rate at which energy is expended’. If we transfer that into human terms, then power is the ability to do work. The catch is that that definition could just as easily apply to slavery – ‘arbeit macht frei‘ and all that – so we’d best urgently add at least one rider to that definition: Power is the ability to do work, as an expression of personal choice, personal responsibility and personal purpose. But if power is the ability to work, then what is ‘work’? The short answer is that work is whatever people do. Digging a ditch is work; solving a technical problem is work; but so is calming a fractious child, or reclaiming hope from despair. Power is the ability to do work, as choice; and work is whatever people choose to do. 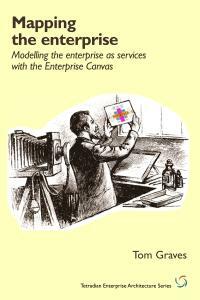 Note that, exactly as with the asset-dimensions in Enterprise Canvas, most real contexts involve work on multiple dimensions at once. Starhawk’s power-with, almost by definition, involves relational work, creating and maintaining connections between two or more people; and her power-from-within is, in essence, spiritual-work, working on one’s sense of self, meaning, purpose; so when power-with actually happens, it’s a process within which both relational-work and spiritual-work take place at the same time, in different ways for each of the parties in the interaction. In team-work all of the power-with interactions are going on at the same time as the mental and/or physical work of the overall team. 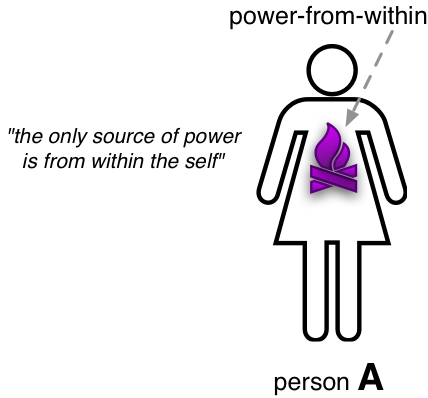 To reframe all of the above in Starhawk’s terminology: power-from-within is the ability to source and access human power from within the self. And power-with is the ability to assist each other to generate and access power-from-within, and to share that power with others. Or, to crosslink it back to that crucial point about choice, power-with is the ability to do work, as an expression of shared choice, shared responsibility and shared purpose. Notice that none of that is inherently gendered. Yes, there are all manner of gender-stereotypes around in every culture, about work and work-to-be done – for example, assumptions or assertions that men are better at thinking, or women are better at relating. Real-world evidence, though, quickly shows us that most of those assertions are arbitrary at best: most of the differences between the genders are relatively minor, and are more than compensated for by much larger variances within each gender. In most contexts, most of those gender-stereotypes are more of a hindrance than a help, especially when dealing with any individual case or context. 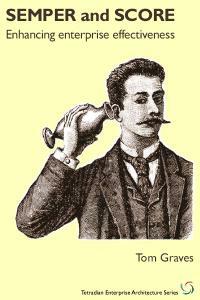 First, and perhaps most often missed, is that it doesn’t work – literally. Since its definition of ‘success’ is that work is avoided, then by definition the more ‘successful’ it is, the less actual work gets done. More worrying is that, as a delusion, it’s extremely addictive: because of the deep-seated belief that it ‘should’ work, it’s therefore applied more and more as less and less successful outcome is achieved – particularly when the respective work can only be done by the self, such as in all forms of spiritual-work (‘sense of meaning and purpose’, etc). It also leads to a more worrying social-delusion that power and status should pertain proportionally to those who do the least work, or who most entrap others into doing the work on their behalf. Hence, all too often, dysfunctional business-hierarchies, or hierarchies of all kinds. Hence, too, the social reality that the closer one gets to doing effortful physical-work, the less one gets paid – of whom the extreme are mothers and other carers, who do some of the hardest work of all, yet in our insane money-based economics are deemed to be ‘worth’ almost nothing. If we explore the Duluth Model in more depth, it becomes clear that there are two quite distinct themes going on within all of those forms of abuse, but interweaving with each other in different ways. To maintain the alignment with Starhawk’s model, we could describe these two forms of power-against respectively as power-over and power-under. Unsurprisingly, this ‘power-over’ is close to the implications of the classic ‘pie-slice’ power mode: it’s actively dysfunctional. For the purposes here I’d define it as follows: power-over is any attempt, by anyone, toward anyone, to prop Self up by putting any Other down. (There’s also a ‘lose/win’ version, putting self down to prop others up: that’s often thought of as socially praiseworthy, but in reality it’s ultimately every bit as dysfunctional as the ‘win/lose’ version.) The colloquial term for power-over is ‘violence’. Notice the key point about “from anyone, to anyone”: ‘the Other’ might well also be Self – such as beating myself up for failing to get this written exactly on-schedule. ‘Power-under’ is a bit more subtle, not least because, for the most part, it’s passively dysfunctional – it’s more in what isn’t done, rather than in what is. For the purposes here I’d define it as follows: power-under is any attempt, by anyone, toward anyone, to offload responsibility onto the Other without their engagement and consent. 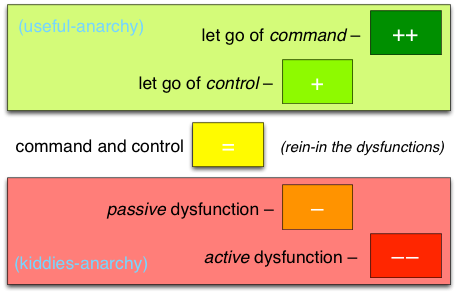 (As with power-over, there’s also a ‘lose/win’ version, taking on responsibility from the other without their engagement and consent – and again as with power-over, it’s often seen as praiseworthy but in fact is equally as dysfunctional as the ‘win/lose’ version.) The colloquial term for power-under is ‘abuse’. Notice again the key point about “from anyone, to anyone”, because again ‘the Other’ may actually be the Self – such as in my trying to put off writing this until tomorrow. Collectively, power-over and power-under are aspects of what I described in that summary earlier above as ‘power-against’. When fully supported by mutual power-with, constructive power-from-within drives an upward-spiral into ever-greater achievement – although technically a form of useful-anarchy, since it’s always ultimately an expression of the individual as individual. By contrast, the huge danger of power-against is that, in any form, they can become deeply addictive, driving a downward-spiral into full-blown ‘kiddies’ anarchy’. But what about gender and power-against – such as in Starhawk’s assertion that power-over (and, by implication, power-under) is inherently ‘masculine’? 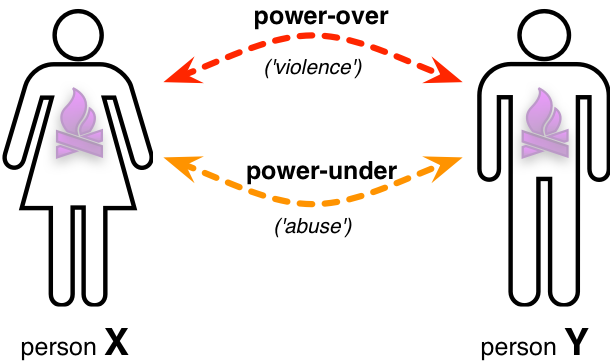 The Duluth Model essentially follows Starhawk’s power-model, and arbitrarily asserts that all forms of violence and abuse are exclusively male. For this reason, Duluth’s descriptions of abuse and violence only use male-pronouns for ‘perpetrator’, and female-pronouns for ‘victim’. Yet from a systems-thinking perspective, it again becomes clear that there’s a really simple ‘thought-experiment’ that we could apply here: swap the gender-pronouns in each of the descriptions, and see if it still makes sense, in terms of real-world practice and real-world evidence. Which it does. Exactly as much as the original ‘it’s all men’s fault’ way round. Which means that there is no defensible justification, at all, for the gender-assertions on which the entire Duluth Model is based. Which means that all of those assertions about ‘it’s all men’s fault’, and the resultant demands on men within that model, are built almost entirely around ‘Minimising, denying and blaming’, and third-party abuse. Which means that in its own terms, the Duluth model is inherently violent and abusive; and that far from reducing violence and abuse, the entire model is structured in such a way as to create it. And then blame the victims of that violence for the violence. 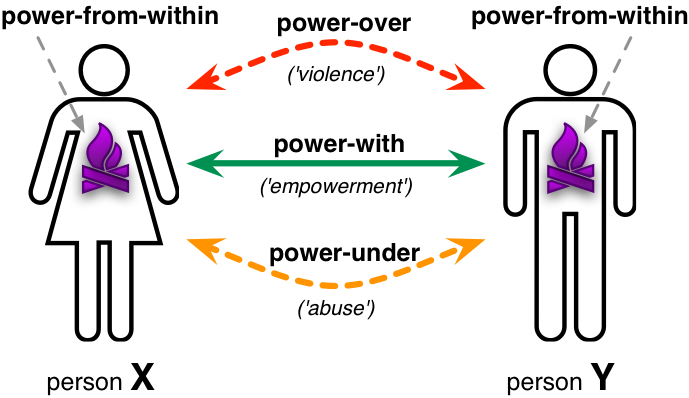 So with regard to those attempts at gendering power and violence in Starhawk’s power-model and elsewhere, let’s just drop any gendering of power. Completely. Just drop it. It’s fundamentally dishonest, and it doesn’t work – in fact all it does is makes things worse, for everyone. The blunt reality is that the refusal to acknowledge women’s violence – violence and abuse by women – is ‘the invisible elephant’ that cripples Starhawk’s power-model. It’s not just Starhawk, either: it seems more like a total taboo that runs throughout almost all of feminist and ‘pro-feminist’ theory and literature, certainly since around the early 1980s. We see variants of much the same taboo evidenced throughout most Western-culture media since that period, too. I have no idea why that taboo should even exist, let alone be so predominant, but the crucial point that needs to understood is that the refusal to acknowledge even the fact, let alone the true scale, of women’s violence, hurts women as much if not more than men. One first-hand example for me was that I originally got involved in domestic-violence resolution to help two of my lesbian friends after they’d ended their relationship in a knife-fight, yet had been refused any help from the state-run domestic-violence service because there was no man to blame. There are occasional signs of something resembling honesty on this overall theme – the film Mean Girls is one example, based on Rosalind Wiseman’s research-based book ‘Queen Bees and Wannabes‘ – but these tend to be rare exceptions to an otherwise almost total blackout in media and elsewhere. Which is a pity, really – for women especially. Remember, though, that gender is not the key point here: whilst it’s true that the parties in a dysfunctional ‘power-against’ relationship might well be respectively male and female, but they could just as easily be both male, both female, same or different ages, same or different cultures, even human and non-human once we start to look in more depth at relationships with animals and the like. It’s all about power – either power-with and power-from-within, ‘the ability to do work’; or power-against, power-over or power-under, the delusion of ‘the ability to avoid work’. Those are the only two choices – power-with, or power-against: and power-against doesn’t work – for anyone. He has made her morally, an irresponsible being, as she can commit many crimes with impunity, provided they be done in the presence of her husband. Note, though, that it wasn’t solely about “in the presence of her husband”: if a married woman committed a crime, the husband alone was legally liable for the offence. Without legal responsibility for her own actions, the only way that this can possibly be made to work in practice is for the woman to be assigned the same legal status as an infant: in other words, no responsibility, but also no power. Or, to put it the other way round, in terms of that power-model above, the only way in which women could validly be assigned the exact same social and legal power as men is if they have the exact same legal responsibilities. Anything less than that, in terms of responsibilities, would imply some form of structurally-imposed power-under on women’s behalf – inevitably triggering off a perceived ‘need’ for some form of power-under or power-over to defend and balance against that power-under, and onward into a codependent downward-spiral. In short, not a good idea. Which is precisely why the delegates at the Seneca Falls Convention included that concern in their ‘Declaration of Sentiments’. What do women want? Everything! What are we responsible for? Nothing! The catch with ‘rights’, as I’ve explained in various posts here, is that they simply don’t work: they combine a declaration of a desired outcome – yet absent of any indication of how the heck it can be achieved – with an assertion of absence of responsibility: it’s my right, others alone are responsible for giving it to me. This is true of all purported rights, but it’s especially problematic when the rights are inherently asymmetric – as in the ‘women’s rights’ case – because then the excluded group (i.e. ‘not-women’, in this example) are arbitrarily assigned all of the responsibilities but none of the ‘rights’: again, structurally-imposed power-under, hence, again, not a good idea. The key problem with so much of the ‘women’s rights’ discourse is that it’s almost completely absent of any notion of mutuality or fairness: instead, it’s all about a one-sided ‘entitlement’, powered by vast amounts of self-dishonesty and Other-blame. Which is precisely why it’s still going nowhere at present – and is unlikely to go anywhere further until those issues are honestly faced. Which is kinda sad, really, because this kind of mess hurts everyone – and yet, with quite a small amount of real systems-level thinking, the structural aspects at least of the mess could be resolved with very little effort at all. I guess that’s how I most feel about the current mess on power and gender: a crushing sense of sadness. Almost all of that pain and misery could have been averted if the people involved had bothered to think, for more than a few seconds, before indulging in power-models that might have looked good on the surface but were hopelessly inadequate for any real-world use. A quick glance at the SCAN frame at the top of this post should be enough to point out the more obvious of the problems: the Marxist-style ‘pie-slice’ model is not so much Simple as ludicrously simplistic; and Starhawk’s power-model, if somewhat better in some ways, is still a classic Complicated, seemingly ‘logical’ yet rendered utterly unusable by a mess of unexamined assumptions. Oh well. The one theme I’ll admit to some amount of anger about is that so many self-styled ‘women’s activists’ have so repeatedly demonstrated such an abysmal lack of thought, awareness, observation or empathy – a theme we’ll return to in the next post in this series. For example, it never seems to have occurred to them that men don’t actually feel any more powerful than women do – and in most cases never have done. By now, those activists must have tried, and demanded, just about every possible combination of blaming men for everything, and trying to dump onto men alone the responsibility for everything: and none of it has worked well, for anyone – an outcome that should be entirely unsurprising, given the analysis above. And yet all of that pain could have been averted by little more than a few moments’-worth of thought and observation, coupled with perhaps a pinch or two of much-needed self-honesty. It’s probable, in fact, that the only real outcome of some five decades’-worth of ubiquitous, insistent, ever-increasing ‘feminist’ tirades, in Western cultures especially, is that it’s made life for those men even more hellish than it already was. Hardly grounds for congratulation, I’d suggest…? If we want to resolve those all-too-real problems around power and gender, for everyone, we really do need to do better than what’s been done so far… But I do hope that that reworked power-model above can indeed provide something useful to help in that. Over to you, anyway. What energies, assets and resources will be needed for that work to be enabled and enacted? Who or what has the power – the responsibility or ‘response-ability’ – to do that work? Where do any structures risk creating a context where one or more systems prop themselves up by putting others down – such as by demanding arbitrary priority, or creating a deadlock? Where do any structures risk creating a context where one or more systems attempt to offload responsibility onto others without their engagement or consent – such as in a mission-critical control-system left to run inappropriately ‘open-loop‘? What mutualities and interlocks are required to ensure that the system overall runs in a balanced way that is ‘fair’ to all parties in the interaction? Who or what decides what constitutes ‘fair’ within the design and operation of the system? Apply these questions also to broader-context concerns. For example, what happens when you reframe security and access from ‘rights’ to mutual interlocking responsibilities? What are those responsibilities? What are the mutualities and interlocks that make it work for all parties? What’s needed to maintain the balance of responsibilities across the whole domain? The ‘Validation‘ model in Enterprise Canvas may also be helpful for this. 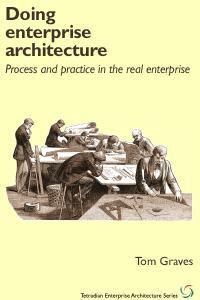 Power-issues of many different kinds are obviously also utterly central to most EA work, especially once it moves beyond a strict IT-centric domain. The checklist above applies in exactly the same way, but please, please, use that checklist with care. 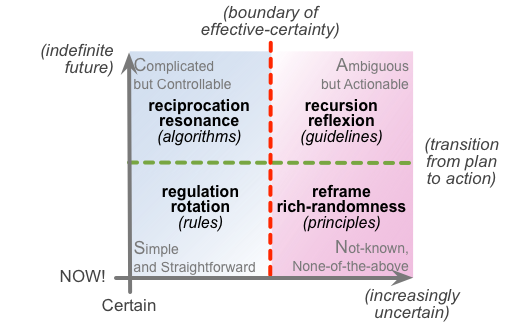 In particular, do not try to use it in the complexities of human contexts without having first had a significant amount of practice on relatively straightforward technical-systems at progressive levels of complexity, from Simple to Complicated to Ambiguous to Not-known. Although the critiques in the post above focus primarily on power and gender, the similar (and mostly non-gendered) power-dysfunctions in the workplace too often manage to be even worse: in the business-context, the term ‘kiddies’-anarchy’ may gain all too real a meaning… and the wrong kind of carelessness around human power-issues can be a career-killer, or worse. You Have Been Warned, please? For a practical example, consider the balance of responsibilities, mutualities and interlocks needed across the entire set of investors and beneficiaries in an enterprise: the ‘Investors‘ model in Enterprise Canvas maybe useful as a crosscheck for this. 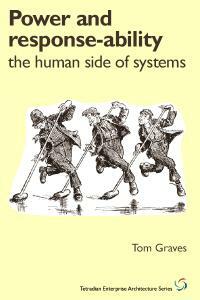 You may also find useful the ‘manifesto’ reference-sheet on power and responsibility in the workplace, that I wrote to accompany my book Power and Response-ability: the human side of systems – the ‘manifesto’ is a free download in PDF format from the Tetradian Books website. Yep, and it’s still going on. Just look at all the male pseudo-feminists on Twitter! After some considerable debate with myself I’ve decided I really have to respond to this. I’d have preferred to ignore it but it’s been gnawing away at me. I have no desire to question the authenticity of your experiences (or those of Phil). They are, however, apparently very different to my own, no less authentic experiences. That may explain our radically divergent views on the subject of feminism. These intelligent women didn’t say “everything is the fault of men” and neither did the books they read. They didn’t ask men to solve their problems for them. In fact much of what you say about power I have learned from them. No one ever tried to make me feel guilty for being a man. Anyway, feeling guilty is an utterly inappropriate and useless response. No wonder it didn’t get you anywhere. By the way, Phil, what is a pseudo-feminist? I probably won’t have anything else to say about this but I’ll check for a response. P.S. I would never call myself a feminist. That’s a definitional issue. The dictionary would allow it but it doesn’t work for me. In a sense, I’m glad it’s been gnawing at you 🙂 – because these are very important issues, and they need to be explored in depth. Perhaps a key difference between us is that, yes, I was indeed taught to make myself feel guilty and blame myself for girls’ and women’s violence since a very young age – certainly long before I went to school. It’s taken me a very long time to recover from that conditioning: I probably only started to get out of it at all in my mid-forties, and I’m still not fully out of it now. I probably never will be, to be honest, but I am at least conscious of it, which I certainly wasn’t before. I used to hold a position probably very close to yours: like you, my experience has been that I learnt a very great deal from the nominal ‘feminist’ perspective, and, when working with women (or men, for that matter), I very much prefer to find those who are self-honest enough to to ‘blame everything on men’, and to face up honestly to the consequences and responsibilities of that fact. In my experience, unfortunately, such women seem to be quite rare – and especially so in Australia, where, bluntly, the culture is spiralling down into such intense and ever-more-pervasive male-blame and structurally-embedded abuse against males, that there are real risks of an explosive backlash (as we’re seeing, in fact with increasing rise of the biker-gangs in working-class culture there, and to some extent also with the rise of fundamental-Christian and fundamentalist-Muslim sub-cultures which have rigid views about ‘the proper place for women’ and suchlike). 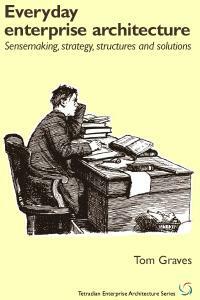 Which would not be a good idea… (in my opinion, anyway, and I’d guess so in yours, too). 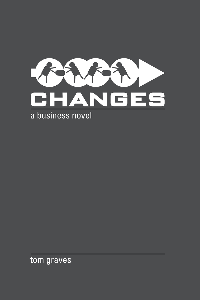 What got me to change my ‘human-first’ position, and – bluntly – rise out of my political torpor, was that was that not only was the structural-abuse getting worse, almost by the day, but that it was so deeply embedded into the sociopolitical process that the damage was fast becoming irreversible, in ways that would ultimately hurt women even more than men. 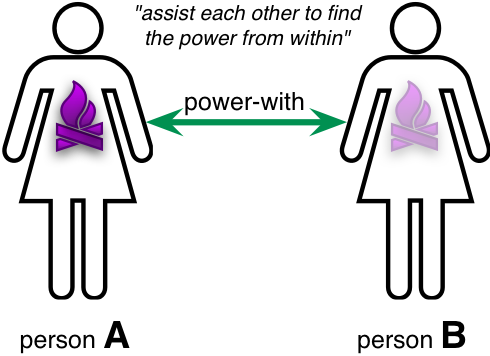 Starhawk’s power-model, as per above, is a good example: it takes less than five minutes of analysis and real-world observation to demonstrate to demonstrate that it is not only fundamentally-flawed, but in essence yet again traps women into a position of narcissistic Other-blame, which inevitably saps their power. Hence, not a good idea, for anyone – women or men. And yet that flawed model is again re-used in the Duluth Model, which is even more deeply-flawed, and which, again, takes barely five minutes to demolish, using the most basic of system-thinking techniques – and yet its use is mandated by law in the majority of US states, and many other countries (including throughout Australia, I believe). If something that incompetent is used as the basis for law – apparently without even the most basic of checks or review – then clearly something is seriously wrong, right down at the very roots of the sociopolitical process – and we need to challenge it if the the real aims of those “intelligent women” (quite apart from anyone else) are not to be trashed beneath layer upon layer of imposed stupidity. Remember, too – and I perhaps have to keep hammering this point – that a) although the gender-issues area is problematic enough, it is still considerably less serious than the ‘rights’ problem and the ‘possession’ problem, the latter of which has dangerously-real potential to wipe out almost all life on Earth – hence gender-issues is actually a relativelysafe(!) area to work on; and b) the aim of this specific RBPEA-series is that that exploration around gender, and the insights that it triggers, are used primarily to help people to do reframe and rethink back down at the level of routine everyday enterprise-architecture, which for the most part would barely touch upon gender as such at all. It’s not about gender: it’s about thinking. If you get too hung up about gender here, you’ve missed the whole point of what RBPEA is all about. I considered anticipating your last point in my comment but decided to wait. I’m sorry Tom but what comes across, not least from the volume of words, is that it is indeed about gender. Let’s put it differently. If gender is just an illustration and your position on that could be shown to be incorrect, would that undermine the whole RBPEA approach? Or would it just mean you were wrong about a particular example? Or yet another way. Do you think it’s possible to have understood and agree with the whole RBPEA approach and still disagree on how you apply it to gender? I don’t think I for one moment have “missed the whole point of what RBPEA is all about”. Why don’t you try illustrating it with a different topic? I’m going to leave the discussion for now. Don’t worry, I’m not in a huff. I’ll just watch and see how things develop. It is indeed about gender, in the sense that there are a lot of things that are very, very seriously wrong about our culture’s approach to gender – in particular, the unquestioned-assumption-laden abysmally-one-sided views that are currently most often used as a substitute for thinking or observation. It is also very definitely not about gender, in the sense that we see the same unquestioned-assumption-laden abysmally-one-sided non-thinking happening in way, way too many areas throughout our culture – the inane IT-centrism of TOGAF and its ilk being just one example that we all know only too well. Another way to frame it would be that it’s possible to disagree with how I apply it to gender, as a way of not understanding RBPEA whilst thinking that one has? If you’re going to engage in this, then, please, properly engage with it: don’t just tell me ‘you’re wrong’ and then run away? I have. Often. See, for example, the Four Principles series. For the most part, they were all but completely ignored (you were one of the few people who did respond, and I thank you for that). It is interesting, though, that even the mere mention of gender as a valid topic for investigation triggers off such a raw nerve with so many people. It really does show the scale of tension created by the fact that it really is a very, very long way from anything resembling ‘fairness’ – in either direction, by the way – and that so much effort is still being placed, backed up by so much violence and abuse, to cover up that fact. No to the first question; and yes to the second. The latter would be entirely unsurprising, of course – I’ve often been wrong, and I no doubt will continue to be so in the future. But since you haven’t said, at all, why I’m supposedly ‘incorrect’, I’m just left floundering – and also with no means to distinguish between being wrong with the RBPEA concept and process, or merely ‘incorrect’ in specific details of one application of that process, or ‘incorrect’ in terms of specific real-world observations that feed into that example. Which is it, please? Thanks for this, Kathy – perhaps particularly for the pointer to Janet Hagberg’s book. Yes – exactly the key point I’ve been making above (and elsewhere). It’s true that there are gendered-overtones, in the sense that, statistically, “men are more comfortable with some and women with others” – but that’s very different from saying (as too many commentators still do) that it somehow ‘is’ gendered. It’s also very different for each individual – some men are more ‘feminine’ and some women more ‘masculine’ than those crude gender-stereotypes would expect or allow. Thank you for this surprising, thorough and inspiring article. However, that still left me with some fundamental questions regarding the nature of power. Google suggested your work directly after Miki’s. Although I haven’t quite read and processed all of it since I opened the link a couple of days ago (on p. 10 now), I am very much impressed with the depth of your thinking and the clarity of your writing. I have found answers to questions that had been looming behind my original quest, and others that had been waiting in my mind for light, as well as pointers toward new relevant questions and answers. Hi Tess – very glad it’s been useful to you. I’m painfully aware that a lot of people find my work on these themes somewhat, uh, challenging at times – so I really do value that you’ve understood what I’m actually aiming for here, namely to help people find their own power, and the responsibilities and options that go along with it. 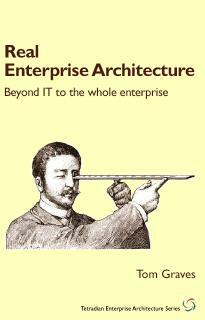 My main work these days is in whole-enterprise architectures – the structure and the story behind how large organisations operate, seen both from within and from the outside. 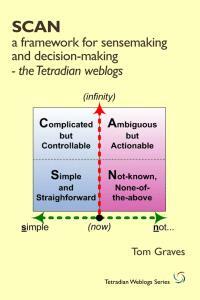 There’s a lot more detail on that on this weblog (some 1200 articles so far) and on my Slideshare collection – see http://www.slideshare.net/tetradian. Do have a wander around – there’s quite a lot that may well be useful in your work on NVC in mainstream organisations. I don’t know which of the articles in this series you’ve read, but it’s perhaps important to state that the starting-point for my work on this was to help two of my lesbian friends after they’d ended their relationship with a knife-fight – fortunately without doing any damage to each other, but they definitely needed to be able to part cleanly, with proper closure. They’d initially gone to the (women-only) domestic-violence service, but had been turned away on the basis that “it couldn’t have happened because you’re both women, you’re rocking the boat, shut up and go away” – in other words, a classically violent denial of violence. 🙁 I took the then-supposedly-standard model on domestic violence – Duluth, which arbitrarily defines all violence as ‘male’ – and stripped out all of its assumptions about gender or heterosexuality, to derive at a model that is strictly gender-agnostic and that explicitly rejects blame (whether to Other or Self) and suchlike as merely other forms of violence. 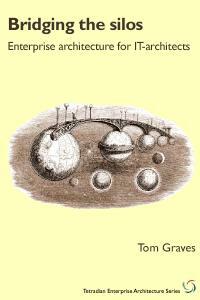 For more detail on that – including full overview of intervention-procedure – see the ‘Duluth redesign’ section on my old TomGraves website at http://tomgraves.org/duluth. Hope it’s useful to you, anyway. 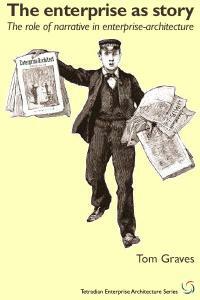 Hi Tom, I really enjoyed your article. I’m trying to start a discussion group at my college that will focus primarily on issues of gender and power in our society. I was wondering if I could use an image from your post on our Facebook page (the one with power-over, power-under and power-with). Please let me know, and thanks again for the article. 4 Pings/Trackbacks for "RBPEA: On power and gender"